OLIVE ASCOLANA Recipe. Stuffed fried olives from Ascoli Piceno, Italy. | Travel Blog & Co.
OLIVE ASCOLANA Recipe. 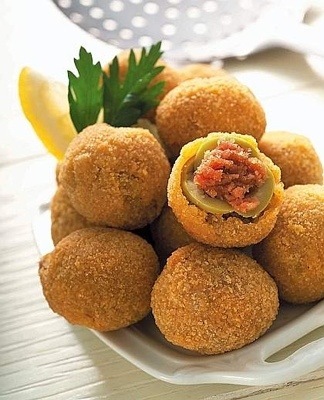 Stuffed fried olives from Ascoli Piceno, Italy. “As one might guess from the name, Olive all’Ascolana are from Ascoli, in the Marches. They are among the best-known Italian stuffed olives, and booths selling them at fairs are invariably mobbed. If at all possible you should use olives of the Ascolana strain, which are large, green and mild, and were already renowned in Roman times, though the recipe for transforming them into stuffed olives is more recent, dating to the 17th century. Though they’re generally classified as an antipasto, they’re a superb finger food and will also work well as a first course, or as part of a platter of mixed fried foods. Don’t overstuff the olives lest the stuffing expand as it cooks and split the olives, and keep in mind that the oil should be hot but not smoking, lest the outsides of the olives burn before the stuffing is done. If you do decide to taste one to test for doneness have a glass of water handy because the inside could still be quite hot even if you have blown on it. The above ingredients will serve 4, or make a pleasant bowlful for a party. Finely dice the veal, crumble the sausage, and sauté them in the butter. When they have browned, sprinkle the wine over them, let it evaporate, stir in the diced lard, and continue sautéing gently for 5-10 minutes (you want the meat to brown but not burn). Stir in the broth and simmer for five minutes, then remove the meats to a bowl with a slotted spoon, leaving the drippings in the pot. Stir two heaping tablespoons of the bread crumbs into the drippings. Grind the meat mixture and combine it with the breadcrumbs you stirred into the drippings, then lightly beat one of the eggs and work it into the filling too, with the parsley, grated cheese, and nutmeg. Check seasoning and let the filling rest for a half hour. Pit the olives if they weren’t already pitted, and fill them. The easiest way to do this is to put the filling in a pastry bag or syringe of the kind used for frosting, with a fairly fine nozzle, and squirt the filling into the holes. Lightly beat the remaining egg. Roll the filled olives in flour, then in the egg, and then in the bread crumbs. Fry them in abundant oil for 15-20 minutes, drain them well, and serve them”. This entry was posted in Worldwide Recipes and tagged articles, ascolana, ascoli piceno, blog, daily post, food, italy, marches, Olive ascolane, olives, postaday, recipe, recipes, travel by costanzafabbri. Bookmark the permalink.